We design entry door systems for all types of homes in Collingwood that boast many types of styles. The right entry door makes a statement and helps make people feel welcome when they walk up to your home. If you are ready to enhance the curb appeal of your property in Collingwood, Ontario with a new entry door, we want to help. At McMillan Millwork & Joinery, we create stunning wooden entry door systems and are confident you will be more than happy with the quality of our workmanship. Whether your home was constructed last year or 100 years ago, we design entry door systems for all types of homes that boast many types of styles. When you turn to us, we will listen to the vision you have for your front door and come up with design plans that capture what you have in mind perfectly. Then, our team of craftsmen will bring your design to life in a way that exceeds your expectations. We have over two decades of experience providing our clients with custom, quality woodworking solutions, and we realize that we would not be anywhere close to where we are today without putting our customers first. 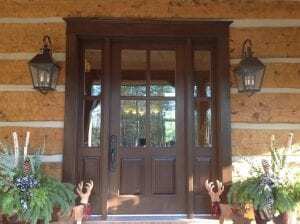 We are equipped to handle the details of any woodworking project and have gone above and beyond for hundreds of our customers who let us craft a new front door for them. While upgrading your home, never settle for less! Contact us at McMillan Millwork & Joinery today to find out more about our entry door systems and how they can beautify your home.